With millions of copies of his Redwall series in print, Brian Jacques is one of the most popular authors in the world. 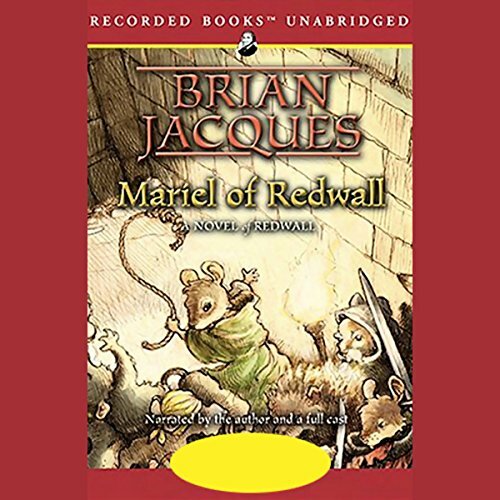 A New York Times best seller, Mariel of Redwall serves up generous helpings of everything Jacques' countless fans love: rousing escapades, mouthwatering feats, and endearing characters from deep in the woods of Mossflower country. Mousemaid Mariel and her bellmaker father are besieged and tossed into the sea by vicious pirate rat Gabool and his thugs. Washed ashore, Mariel is taken in by the kind animals of Redwall Abbey. But Mariel cannot find her father and is certain he has lost his life. With a motley band of adventurers, she swears revenge and begins a perilous quest straight into the heart of Gabool's stronghold, where a few surprises await. Longtime fans of the world Mossflower will find everything they love in this exhilarating tale, while newcomers will have no trouble jumping straight in and getting lost in a magical, marvelous world. Don't miss any of Brian Jacques' Redwall series. A wonderful telling of a classic tale of adventure and food. Redwall books are oft filled with adventures, battles, food, songs, and moments of peace. Mariel of Redwall is no exception to this and is a joy from start to finish. The production brings this book to life in a wonderful way I was not expecting. All the characters are given rich voices that fit them. Even the songs within the book are sang and accompanied by instruments. of all the books in the redwall series, this one has the best selection of characters, villians, heroes and sidekicks. the story itself is not as exciting as some of the other titles, but there is still some good action and it is a wonderful excuse to go romping around Moss flower with old friends! Entertaining to listen to, cast, author, and music were all played well. Good story, looking forward to more. Great book. We have all of the reading books so far, and now we are working on the audio. The audio is really good. My only recommendation is to go with a 3 or 4 on download. Make it a 4 whenever possible. It is worth it. I read this whole series as a kid, have gone back and listened through them as an adult, fell in love all over again. The narration is great, and the story line of Mariel is one of my favorites. Great for all ages, fun adventure! I have listed to this book and this series since I was 5. Very good book! the story was enjoyable and well planned out. the cast brought the book to life. I would recommend it for children, teens and adults, as it has a lot of adveture and misadventure to learn from. Brilliant addicting story! definitely fell into the 'one more chapter' mind here! engaging characters and plot! the cast and Brian jacques bring this story to life I have enjoyed listening to mariel and will now begin to listen to the bell maker. Every child should read the Redwall Series. What made the experience of listening to Mariel of Redwall the most enjoyable? I have read and followed the Redwall series since I was young. Each book brings you new characters, and old ones too. By reading the series you become part of the characters lives and understand the history behind the magnificent Abbey of Redwall. I love the character of Mariel "Gullwacker". She is a fun character, courageous, a good friend and companion, and a role model to all (both young and old). Which character – as performed by Brian Jacques and a full cast – was your favourite? There is no one particular character who could be your favourite. Although the hairs and their war cry make it difficult to remember all characters are important.